With Daylight Savings in full force and days getting longer, winding down at the end of the day to a nice movie can easily be interrupted by sun glares. Don’t we all wish you could move the sun when you want and how you want? Getting up to change the shades on the hour every hour to correlate with the sun glares can be annoying, time consuming and quite the hassle. But with the help of AV Solutions, you can have automated shades installed. 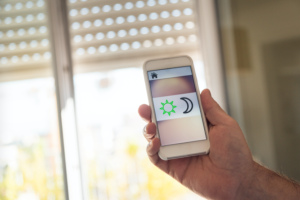 Control how much shade you want in any room of your home with the use of a simple smartphone application or wall-mounted keypad. You can even set up a timer to choose when you want the shades changing without having to think about it again! More Security – have your blinds close when you go to bed, when darkness falls or when you leave the house. Save on Utilities – set your blinds to open or close according to the seasons to help regulate cold and heat transmission through your windows and reduce your electric bill. Privacy Any Time – close the shades with a touch of a button when you’re dressing, bathing or wanting some privacy. Automated window blinds can be used on multiple covering types including: shutters, shades, regular Venetian blinds and vertical blinds. And they aren’t just for the home! You can install automated blinds in your business to stay updated with the latest technology, easily closing shades during a presentation, or opening them back up for a meeting. Learn more about our shading services on our Home Automation page. Contact us today to take control of the sun and better enjoy the spring season!